On Sunday 17 March Voce raised the roof - and a few back-of-the-neck hairs - in London's Grosvenor Chapel with a stunning Passiontide programme encompassing repertoire both ancient and modern. Choir and director Suzi Digby were joined by the Voce Chamber Orchestra in a concert of Tallis, Macmillan and Ešenvalds in the last weeks of Lent. Each half of the programme opened with a set of Thomas Tallis' hauntingly beautiful and intricate Lamentations of Jeremiah the Prophet - followed in the first half by James Macmillan's Seven Last Words From The Cross, in which the choir was joined by string players from the Voce Chamber Orchestra. The concert concluded with a moving performance of Ēriks Ešenvalds' Passion And Resurrection. 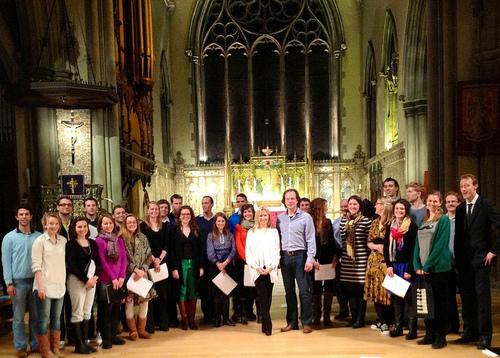 As one of our guests of honour, journalist Jon Snow, remarked: "Ešenvalds' Passion and Resurrection stole the night at the Grosvenor Chapel: the texture, colour and depth of Voce's singing gave extraordinary vitality and a moving insight into one of the most spectacular pieces of 21st century choral music." You can read Jon's full review of the concert on Voce's Facebook page - or catch his piece on us and conductor Suzi Digby in his New Statesman diary. Voce would like to thank early music expert Dr David Skinner and composer Ēriks Ešenvalds, both of whom workshopped elements of our programme with us this term. We'd also like to thank the incredible players of the Voce Chamber Orchestra and our musical director Suzi Digby for selecting and leading us in such a wonderful programme. There will now be a short intermission before rehearsals begin in April for Voce's May tour to Berlin. Can't make it to Germany to hear us? Don't despair - our next London concert is on Sunday 7 July, when we perform a beautiful programme of Music From The New World. Were you at our latest concert? What did you think? Tweet us, talk to us on Facebook, or send us a message.